Founded in 1940, OUASDI INTERNATIONAL is a company specialized in processing and export of the carob and its derivatives, as other activities such as: conditioning conservation and distribution of food products. We offer high quality organic products at competitive prices. Our products are exhibited at national and international events, in which a recognition of the quality standards is attributed to production, packaging and distribution. Ouasdi International is strongly committed to quality. Our production, storage and packaging meet the international standards. 1. Carob flour in bags of 10 kg, 20 kg, 25kg and 50kg. 2. Kibbled carob in bags of 10 kg, 20 kg, 25kg and 50kg. 3. Carob seeds in bags of 25 kg or 50 kg. 4. Whole Carob in bags of 50 kg, 100 kg or 12.5 kg corrugated fiberboard. - In big-bags, about 1000 kg. approx. Carob flourcomes from ground carob pods. Carob flour is an alternative to cocoa powder, having several distinct advantages. 5. Vitamin and Mineral Rich. 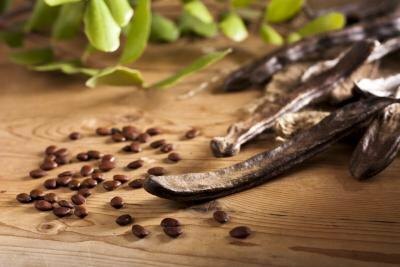 Carob seeds are great for growing your own trees. Carob seeds are processed to make carob gum, which is used as a thickening agent in the cosmetic industry and in the food industry. Known as Locust Bean Gum (LBG) or E410. -Carob kibble nibbles are a great healthy snack. The Carob tree is an evergreen tree with large, shiny leaves, The tree produces thick, long or short, broad pods . The whole pod is used: the pods are roasted and ground into a powder; the pods are also used as animal feed in kibble/crumb form and the pods. The Carob Powder is made first, then products such as syrup, bars and chips are made from the powder. The carob seeds are also used to make Carob bean gum and is used in food manufacturing as a thickener for icecream, toothpaste, diabetic chocolate spreads etc. It is native to the Mediterranean region including Southern Europe, Northern Africa, the larger Mediterranean islands; to the Levant and Middle-East of Western Asia into Iran; and to the Canary Islands and Macaronesia. Our company is a family business that existed since 1940 under the name OUASDI and becomes in 1998 OUASDI INTERNATIONAL widening its products and exporting towards foreign countries. .
OUASDI INTERNATIONAL has grown continually over the years by taking a professional approach to its business, focusing on the fundamentals, hiring top-notch quality people, and developing and providing only the highest quality products to its customers. As a result, it has attracted and maintained a long list of satisfied international customers. In addition to carob products, OUASDI INTERNATIONAL is proud to offer a large variety of the following products: Olive oil, Capers, Pickles, Peppers, Onion, Orujo (olive waste) Olive pomace, Dates, Bitter almondes, Truffle, Acorns. Address: EURL OUASDI INTERNATIONAL BP 42 B RP 06000 Bejaia. ALGERIA.